Mashregh News indicates response to airstrike that killed Iranian general may include assassination of Israeli leaders' sons. A Farsi-language Iranian news site affiliated with the Islamic regime's Revolutionary Guards suggested that the sons of Israeli leaders are being targeted as a response to the Israeli airstrike in Syria last week, in which Iran's General Mohammad Ali Allahdadi was killed. 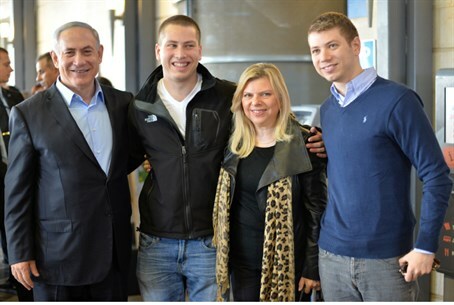 The news site, Mashregh News, detailed that Prime Minister Binyamin Netanyahu's sons Yair and Avner may be targeted, and likewise listed the sons of former prime ministers, including Ehud Olmert's son Shaul and Ariel Sharon's sons Gilad and Omri. The article included an altered image of Netanyahu's sons behind crosshairs, seen from a sniper's scope perspective. It also included general background information on Yair and Avner that is readily available from the internet. In the airstrike, six Iran-proxy Hezbollah terrorists were killed, including Jihad Mughniyeh who was the son of the late Hezbollah commander Imad Mughniyeh. Six Iranian soldiers were also killed, including Allahdadi. Reportedly the 12 were engaged in a surveillance mission planning an attack on Israel from the Syrian side of the Golan Heights when they were taken out by a missile fired from an IDF helicopter. In response, Gen. Hossein Salami, deputy commander of the Revolutionary Guards, threatened a missile attack on Israel, indicating it would come from Judea and Samaria and not from Lebanon. Going further, Revolutionary Guards Minister Mohsen Rafighdoost said last Wednesday that the strike would pave the way for a war against Israel. Reports last Thursday indicated that Israeli military intelligence meticulously coordinated the strike, despite earlier claims that the hit on the Iranian and Hezbollah generals were an "accident." According to Kuwaiti sources, Israel ordered a specific assassination hit on Allahdadi as the general moved between Syrian outposts, through information gained via wiretapping.